NameSpace are London/Midlands based DJ and Producers Ben Shaw and Ben Summers. 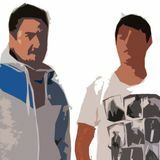 As a duo, NameSpace&apos;s first release was "The Sentinel" which was swiftly signed to highly acclaimed label Stripped Recordings and released in March 2011. The Sentinel was remixed by Deepfunk and Global Underground regular Jim Rivers. Since then NameSpace have gone on to remix tracks by Seb Dhajje, Deepfunk, and more recently D00sh and Orlinski on the IDJ Magazine label of the month, Endemic Digital.